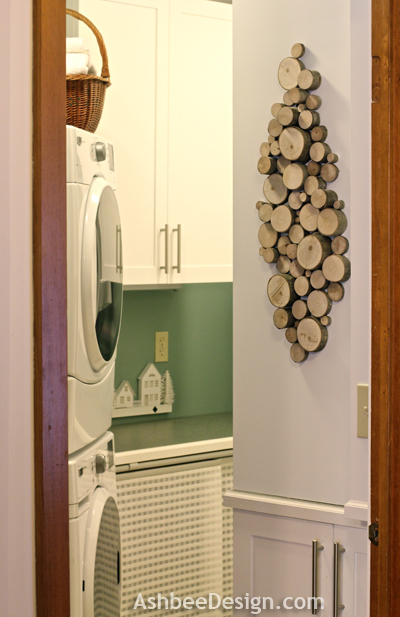 As promised in my last post, here are the steps I followed for making the rustic branch wall art in my laundry room. You need to know that right after I posted my branch wall art yesterday, I got a telephone call from my daughter teasing me. "Mom, you are just about the only person in the world that worries about art in the laundry room!" 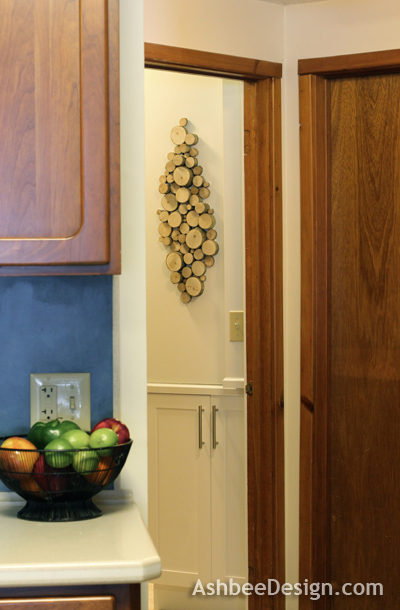 Assorted branches in a variety of diameters - 3/4" up to 4"
Collect a variety of sticks and logs. I selected ones with smooth bark like birch, beech and maple. Using whatever saw you have access to be it band saw, miter saw or hand saw and miter box, cut the branches into a variety of thicknesses. I cut them from 1/4" to 3" in length. I cut about 75 but ended up using 50. Sand one end smooth. I used a belt sander but this could have been accomplished by hand. It would take a lot longer though. I do appreciate the access I have to my husband's workshop! 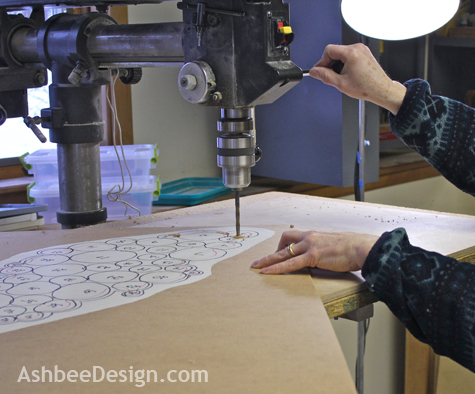 Roll out a piece of paper large enough for your finished wall hanging. I used the back side of some ugly Christmas wrapping paper I had. Arrange the disks in a random layout. I achieved this by taking the 4 largest and placed one near the top, one near the bottom and two in the middle area. I then filled in around them with a variety of diameters. I tried to never have two pieces of the same height touching. 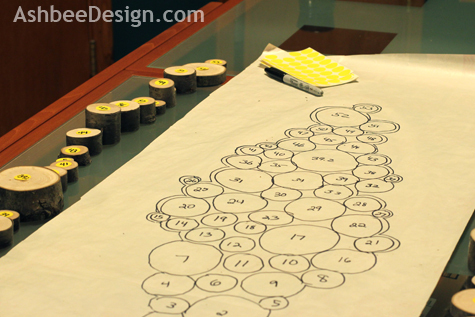 Once you have a layout you are pleased with, trace its outline with a marker. 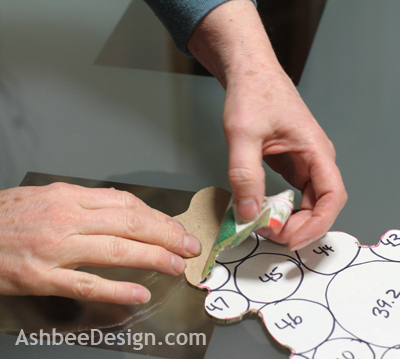 Put a sticker on each piece and number them sequentially. 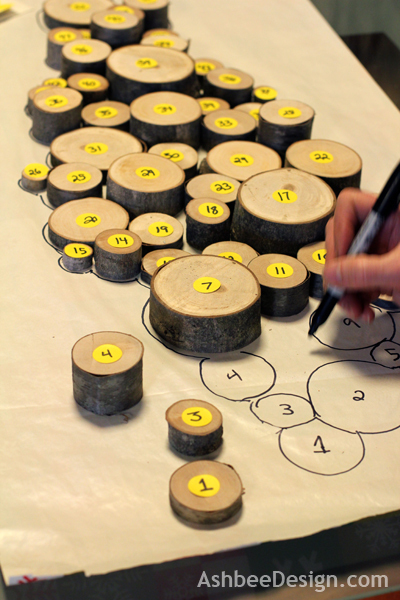 Remove each disk, one by one, and sketch its location adding the number for future identification. Spray adhesive to the back of your drawing and quickly place it on the backing material. I used 1/8" masonite. 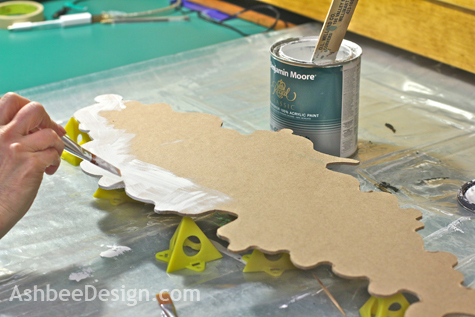 Don't let the glue dry, but spray and place quickly. This will allow you to peel the plan off later. I skteched a line 1/4" inside of the outside rim of my composition. This will be my cut line because I want the wood slices to hang over the edge of the backboard. I don't want the back board visible when this is mounted on the wall. I drilled holes at each of the pinch points. This step is a convenience so the saw blade doesn't get stuck in a corner. I can maneuver more easily if there are open holes. Working on a band saw I cut out the design. The red mark you see above is the inside cut mark I am cutting too. 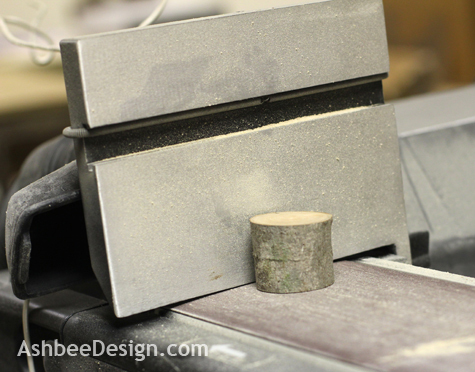 This step could be completed with a little Dremel jig saw as well, and maybe even better because it has a tiny blade. Once the design is cut out carefully peel off the paper design. 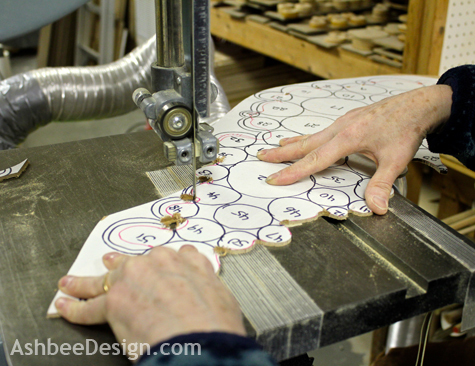 You need to save this to help relocate the wood slices so don't let it rip apart as you peel. 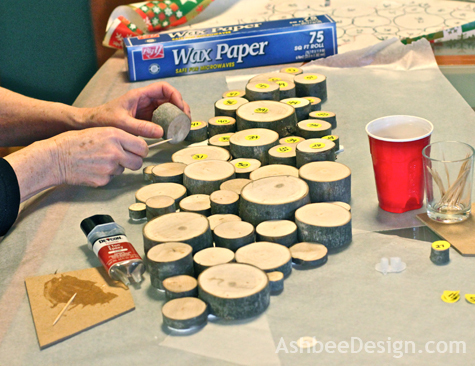 Take a piece of sand paper and do a quick sanding on all edges. They don't need to be super smooth but you do want to remove the roughness. Paint the back board to match the wall. 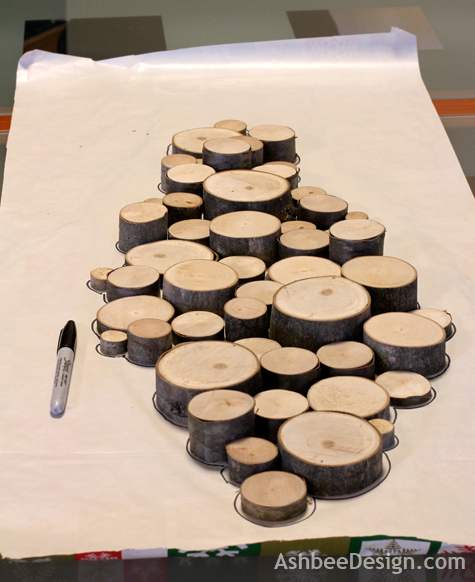 There will be many gaps in the arrangement of wood slices and you want the color showing through to match the wall. I had paint left over from the laundry room re-do. It required three coats to cover and I painted both sides. Once the paint dried, I placed all the disks on the backboard, rearranging them for the best coverage. I tried to match the plan. I mixed up a batch of 2-Ton epoxy, applied some to the bottom of each wood slice and pressed it in place. I saved a couple well placed small wood slices out and didn't glue them down. Instead, I screwed the wall hanging to the wall in those locations and then used Blue Tack to stick the wood slice covers over the screws. And the final result is all I had hoped for. It reflects my love of nature and the warmth it adds by using it indoors but still has a contemporary flair to it. 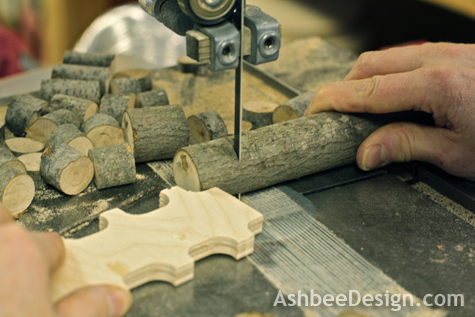 Send photographs if decide to make a wood slice wall hanging for your home! This is beautiful! 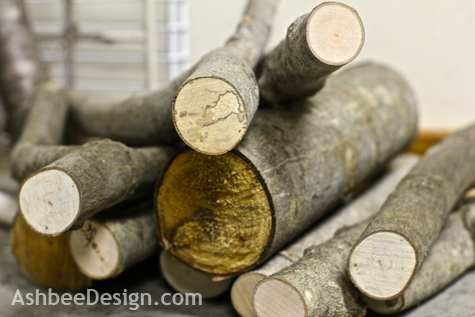 This could be a great project for using fallen branches or from a cut down tree. I love its rustic and earthy appeal. Great tutorial too. We have some incredible storms here over the past year which has brought down tones of branches so I put them to use! Thanks for visiting and commenting. Thanks for visiting and commenting. I'll go check out your lin party. Muy buena idea, poder apreciar toda la veta interior de las ramas. Gracias por compartir tu manera de hacerlo. Great project! May I know what band saw are you using? I'm looking for a good one (for a beginner). I'm sure yours is expensive, I'm just looking at around $200-280 and a dewalt (as recommended by Sawinery) is what I think would be good choice for me.